The End begin with a warm bath of baritone distortion before erupting into a twin bari sax onslaught with pummelling dislocated drums and throat-shredding, down-in-the-cellar cries for sanity. Let’s face it, I could stop there and this would be a must-listen disc. But glorious as the free noise is, there is a great deal more sonic pleasure here for the ears to wallow in. 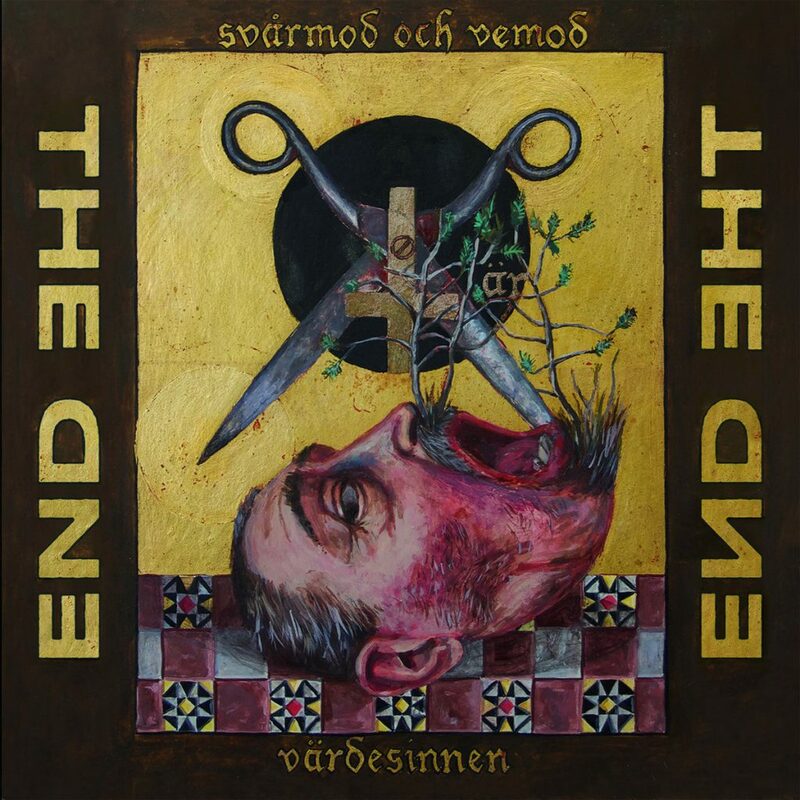 The End is another RareNoise ‘supergroup’ (see last year’s Reflections in Cosmo for another), built around the twin saxophones of Mats Gustafsson (The Thing, Fire!) and Kjetil Møster (The Core, Møster!) and featuring the baritone guitar of Anders Hana (Moha!, Ultralyd), the unrelenting force of Greg Saunier (Deerhoof) and layered with the pure vocal emotion of Sofia Jernberg (Fire! Orchestra). That’s the ingredients listed but what about the resulting dish? After the satisfyingly brutal Svårmod, we enter a more riff-based zone… Vemod’s cyclical and hypnotic guitar’n’drums provide a shifting centre, Jernberg pours forth a wordless exhortation, and electronics crackle and buzz as time slowly runs down. Translated Slaughter and Don’t Wait are both longer pieces and now that we’re beaten into listening submission, things slow down and get itchy. Jernberg’s quiet supplication coupled with breathy grace notes and groans are backed by delicate electronics and minimal tic-tic percussion, all building patiently to intervals of molten, crackling guitar and saxophones jostling heavenwards. Where Translated Slaughter is fiercely uncomfortable in structure and execution, the similarly episodic Don’t Wait brings a funkier, more playful vibe to the kaleidoscope. Rich and Poor is 54 seconds of pure soundmaking for the joy of it. I’m not sure my audio palate was refreshed but as a between-courses dish it serves to separate the ultimately upbeat Don’t Wait from the final track. Both Sides Out is pure grim and satisfying catharsis. Apparently an indictment of the post-Trump western world, it’s both utterly draining and refreshing at once, voice and saxophones vying and combining in a grand wail of despairing vitality. By the way, the title translates roughly as, “Melancholy and sadness are senses to be valued”. Dark times, dark sentiments, dark music but, like the blues, cathartic and somehow positively uplifting. Available from both the RareNoise website and The End’s Bandcamp page.